Shari H. of Columbus, Ga.! If you'll send me your snail mail address via the email button at right, I'll get this headed your way. Congrats! Kentucky is a state I've learned a lot more about in recent years thanks to my dear tea friend Linda of the Friendship Tea blog. In fact, I had a hard time narrowing down the tea things I wanted to share about Kentucky, but I did finally settle on what I (currently) consider the three most important things about Kentucky and the tea world. • You cannot mention Kentucky without conjuring images of bluegrass country and magnificent racehorses, so I think it's only appropriate to mention that the Kentucky Derby is one of the grandest social occasions of the year in this country, for events that certainly include teatime. I love to see the national news coverage on Derby Day since it focuses on the beautiful hats, the excitement of the races, and the grandeur of Churchill Downs. Increasingly, Derby Day tea parties are becoming a "thing," and I am fortunate that I got to attend a Kentucky Derby-inspired tea at Boone Tavern Hotel in Berea, Kentucky a few years ago. (Photos are here.) If you're planning a Kentucky Derby tea party, there are lots of great ideas on the internet. 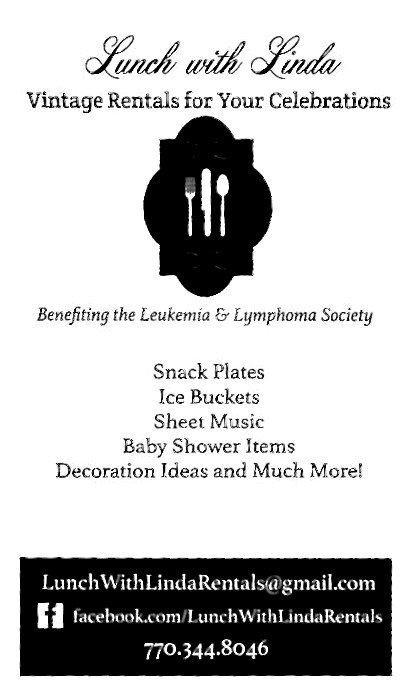 Go here to see a slew of them on Pinterest, and if you don't have the time or inclination, fine, but DO NOT MISS THIS GREAT IDEA for a silverware/plasticware presentation on Derby Day. It's so charming! 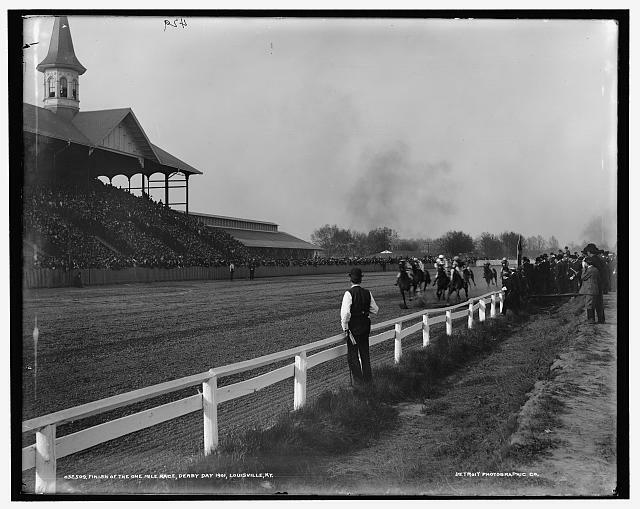 The photo above, courtesy of the Library of Congress, shows the finish of the one-mile race on Derby Day 1901. 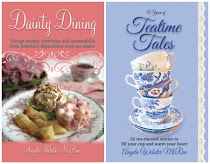 • Some years ago, an older lady in my town learned of my passion for teatime, and this native of Louisville (pronounced Loo-a-vull, not Looey-ville) asked if I'd ever heard of Benedictine tea sandwiches. I had not. 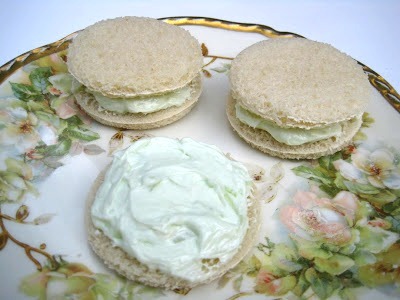 Miss Jennie Benedict was a famous caterer in the Louisville area who created this tea sandwich recipe, and lo and behold, I learned that her Benedictine sandwich is quite famous and very much associated with Kentucky. In fact, I'd say that holding a Kentucky tea party and not offering either a chocolate "Derby Day" pie or a Benedictine tea sandwich would be akin to holding a Georgia tea party and not offering something made with peaches. Wrong, in other words. Here's a recipe I once shared for Benedictine sandwiches. And here's a recipe by the expert on all things Kentucky, my friend Linda. And here's Paula Deen's recipe. And here's Saveur magazine's. If you get the impression Benedictine sandwiches are a big deal, you would be right. 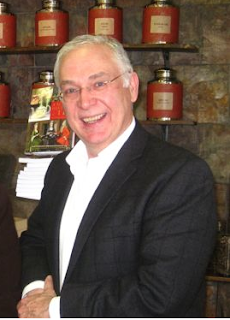 • There are superstars of the tea world just as there are in any field, and one I think must always be acknowledged in any serious discussion of tea in America today is Kentuckian Bruce Richardson of Elmwood Inn Fine Teas. Bruce and his wife, Shelley, once ran the Elmwood Inn B&B in Perryville, Kentucky, and they were among the first to offer not only afternoon teas but also tea education classes that launched many a career. He's now a world-renowned expert on tea, and having had the pleasure of briefly meeting him on several occasions, I can say that he is also a charming and unassuming man, quite down-to-earth and plainly eager to share his passion for tea. I consider him our national ambassador for tea, and those of us who enjoy high-quality teas today can thank Mr. Richardson for helping educate our country about tea through such publications as his books, his articles in Tea Time magazine, and his blog. (I happen to be a bit proud that he's from the South, but that's to be expected, right?) Oh, and I almost forgot to mention how delicious Elmwood Inn's teas are! I've enjoyed quite a few of them, several courtesy of my Kentucky friend Linda, and you can check out the offerings here. I got in late Wednesday night from a local Candidate Forum and discovered a package had been delivered by the postman. 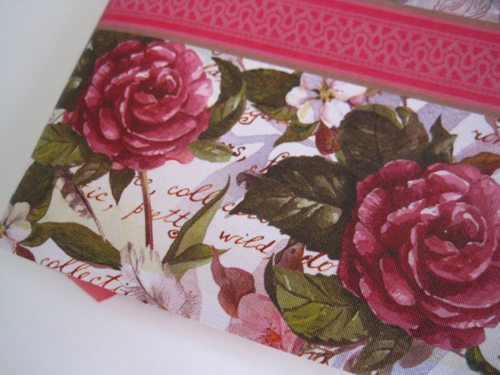 Inside, all beautifully packaged together, were these handmade cards, an early birthday gift from my friend Kathy! My birthday is in May, and Kathy was thrilled her gift arrived early, but as I told her, I'm grateful for a gift whenever it arrives, and aren't these cards gorgeous! I love a handmade gift so much because of the love and time that goes into it. 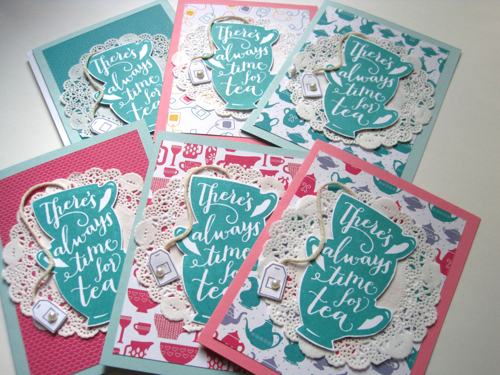 With these cards, I loved seeing all the little touches Kathy included, like the string attaching the tea bag tag and the pearl embellishment. 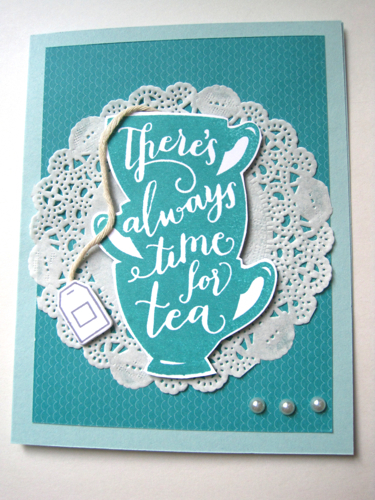 But I think my favorite card may well be this one all in shades of aqua. 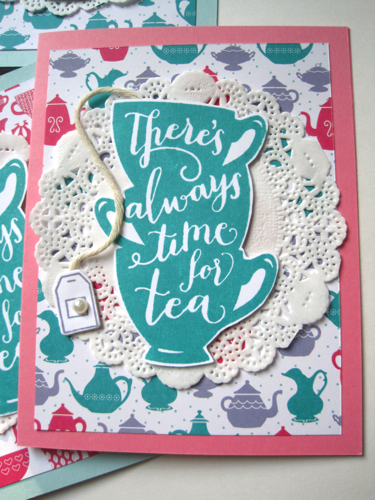 From the pretty lace paper doily to the stamped design and the pearls, I love the soft, elegant look of this card. All six cards are different, and now I'm just trying to tell myself I really *must* send them to friends and not hoard them for myself! 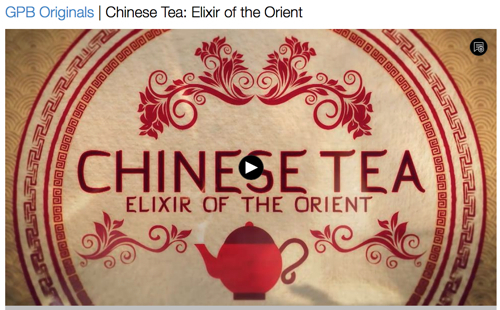 From GPB: "Chinese Tea — Elixir of the Orient"
Thanks to my friend Joy, I learned about a program on tea that would be airing on Georgia Public Broadcasting. I wasn’t able to watch it when it first aired Tuesday night, but I was able to watch it yesterday online, and I definitely need to watch it again, as there is so much I want to write down, research, and explore further! — Have you ever heard the phrase “Water is the mother of tea”? I had not, but apparently it’s a saying well known in China. — Some 18 provinces in China produce tea. — China produces more than one-third of the world’s tea. — Green tea makes up 70 percent of the tea production in China. I also enjoyed seeing the beautiful aerial photography of the tea fields and the lovely images of the tea and teawares, and I was fascinated to hear from some of those in the College of Tea Culture (!) at Zhejiang Agriculture and Forestry University. I've long been intrigued by news of the cancer-fighting properties of green tea, so I was happy to see that discussed and would definitely like to learn more about green tea and cancer. I was also pleasantly surprised to see the Charleston Tea Plantation here in the US briefly featured. I don’t know how long this video will be available for viewing online, but here’s the link in case you’d like to watch it now! Finding tea in the Bible! 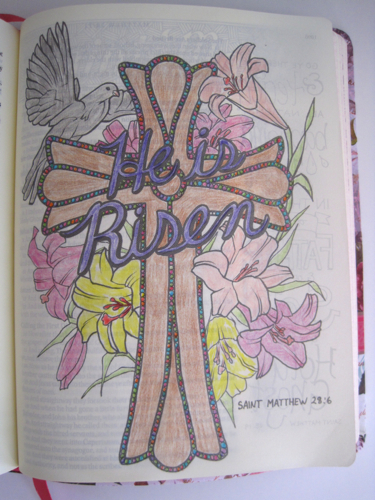 And guess what's one of the first things I colored in my new Bible? 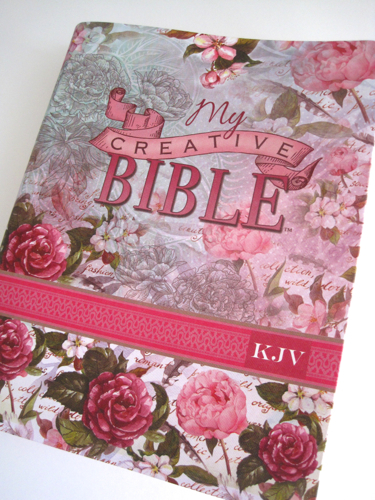 For years I have plundered the pages of scripture looking for a verse on tea, but I just couldn't find one. 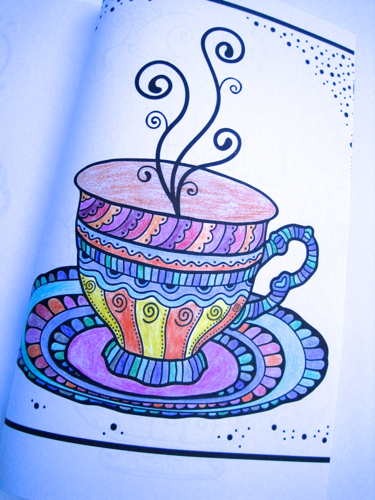 So when I saw this coloring page, I was quite pleased! And I still haven't colored this one yet, but this image of David dancing cracks me up. I think David looks more like John Travolta in Saturday Night Fever here! 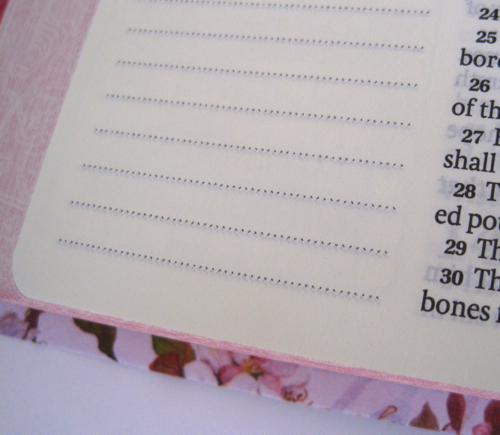 These blank lines for the journaling, however, are the primary reason I wanted this Bible. For years, I've been writing down in various notebooks some of the great phrases I discover right in the middle of Bible verses. I'm forever saving titles for future books and articles. The other day in Sunday School, our teacher was reading along in Isaiah 28 (verse 21), and I latched onto the phrase "his strange work." Wouldn't that be a great title for something, His Strange Work? 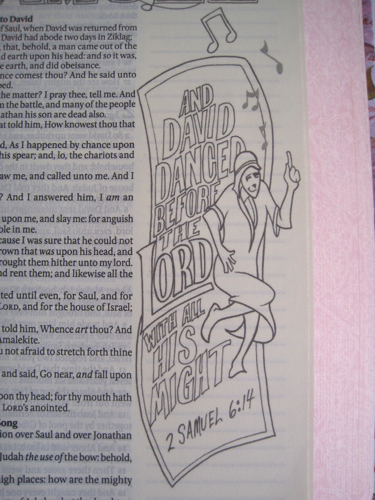 Many years ago, I became smitten with the phrase "harps upon the willows" in Psalm 137:2. Surely that should be the title of something. An article or a book on grief, maybe? Or a mystery about a character who overcomes grief? 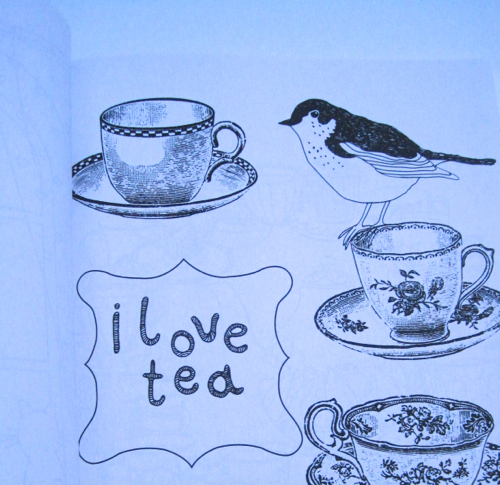 And discovering that illustration with the teacup made me realize that there are no doubt plenty of verses about eating and drinking that can be applied to teatime. Now, I've got a place to record these thoughts (however oddball they may be) and be as creative as I want. 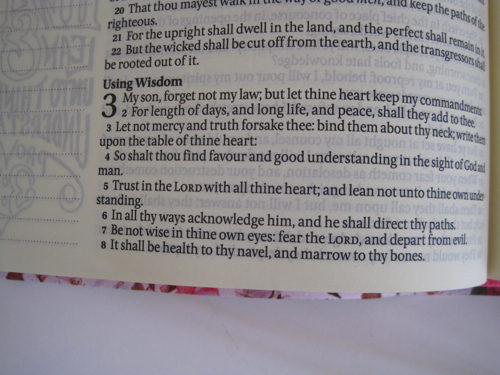 My favorite verses in the Bible are Proverbs 3:5 and 6 — "Trust in the Lord with all thine heart; and lean not unto thine own understanding. In all thy ways acknowledge him, and he shall direct thy paths." 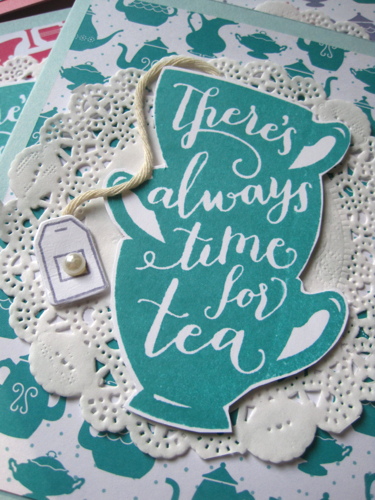 I can't help believing this even applies to the "teatime paths" where I have met so many wonderful new friends! 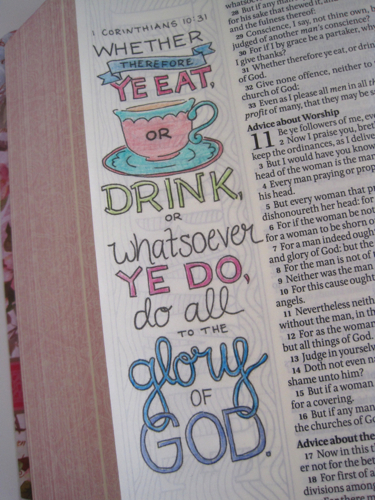 Have you come across any "teatime" verses in the Bible? If you have, please feel free to share them anytime. And if you happen to have a favorite verse, feel free to share that too—y'all know I need all the help I can get! 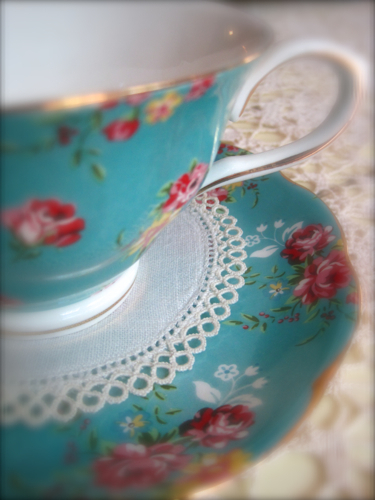 I'm not above copying a good idea, so when I saw a photo of a pretty paper lace doily placed beneath a teacup the other day, I decided I rather liked the idea! 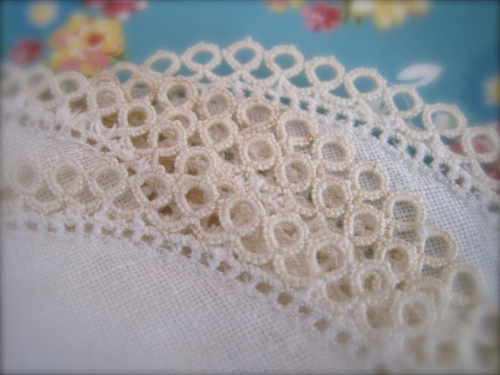 As luck would have it, I had just received some beautiful linen coasters edged in tatted lace. They were a surprise gift from my tea friend Nancy in Puerto Rico. 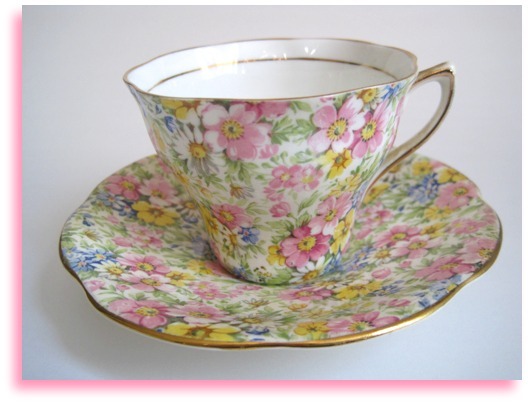 And I must say I love the elegant touch it gives to add one of these to the teacup and saucer. There were six of the lace coasters in the set, and now I'm fairly sure I know what I'm going to do with them! 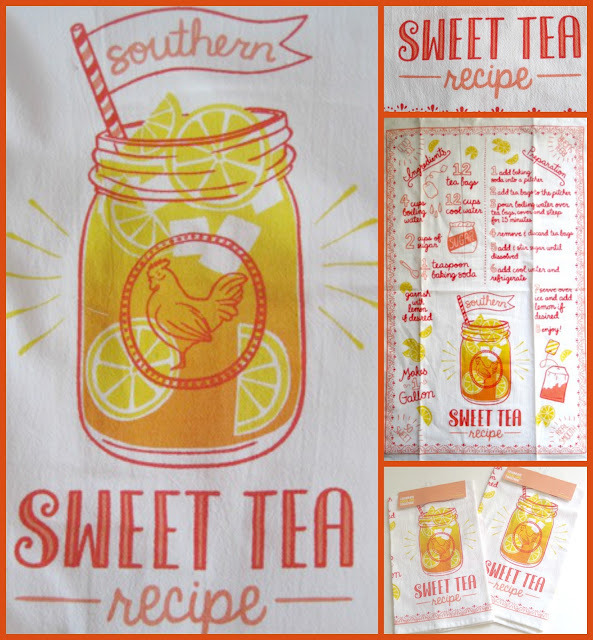 For this month's giveaway, I thought I'd send a little southern sunshine to someone in the US or Canada with this cute tea towel I found at Kohl's the other day! Actually, I got a tea towel for me as well as one for one of you! 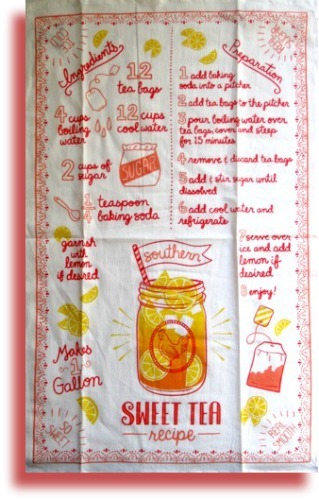 And whether you ever care to make Southern Sweet Tea or not, surely most of us can use another tea towel, right? They're handy, they're not made to last forever, they don't break, and they don't take up nearly as much space as a teacup or teapot. So if you'd like to be entered to win, just leave an "Enter me" type comment to this post between now and 7 a.m. EST Friday, April 29, and you'll be entered to win! Perhaps one of the most oft-quoted lines in all of moviedom is Dorothy's "Toto, I have a feeling we're not in Kansas anymore" in "The Wizard of Oz." Well, this week we most definitely are in Kansas, and it's certainly an interesting place to be! • As I considered the fact that the beloved "The Wizard of Oz" is set in Kansas, I wondered if "Wizard of Oz" tea parties are ever held. Indeed yes! In fact, when I saw the blue gingham curtain that served as a backdrop for this tea party, it made me want to plan a "Wizard of Oz" tea myself! (Do not miss "the yellow brick road of treats," and those witchy cupcakes? Oh. My. Goodness!) 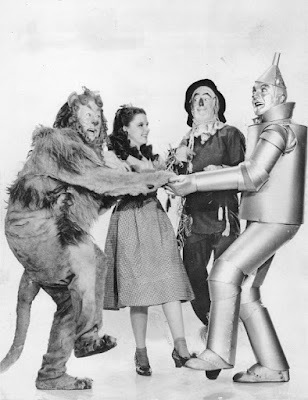 Pinterest also has some fun "Wizard of Oz" party ideas, so there's apparently no shortage of Oz-themed parties going on. 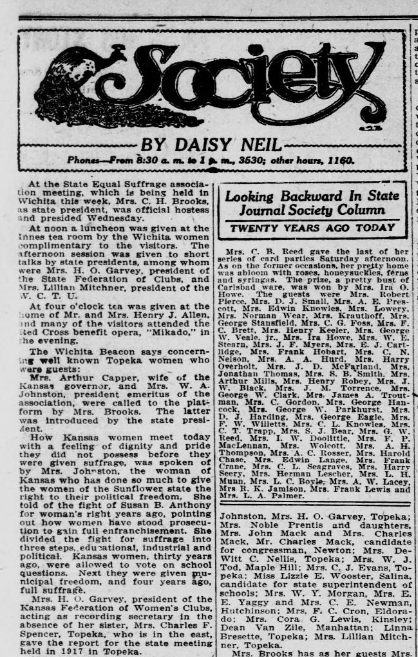 At the State Equal Suffrage association meeting, which is being held in Wichita this week, Mrs. C. H. Brooks, as state president, was official hostess and presided Wednesday. At noon a luncheon was given at the Innes tea room by the Wichita women complimentary to the visitors. The afternoon session was given to short talks by state presidents, among whom were Mrs. H. O. Garvey, president of the State Federation of Clubs, and Mrs. Lillian Mitchner, president of the W. C. T. U. (note: “Woman’s Christian Temperance Union”). At four o’clock tea was given at the home of Mr. and Mrs. Henry J. Allen, and many of the visitors attended the Red Cross benefit opera, “Mikado,” in the evening. Mrs. Arthur Capper, wife of the Kansas governor, and Mrs. W. A. Johnston, president emeritus of the association, were called to the platform by Mrs. Brooks. The latter was introduced by the state president. And the article goes on, and once again I am convinced that tearooms have played an important role in women’s history in our country! I continue to receive offers for free magazine subscriptions, and three of the issues I've read lately all turned up articles on tea! With tea's popularity these days, I shouldn't be surprised that it's showing up everywhere, but I found it in a few places besides Tea Time Magazine recently and thought I'd share. 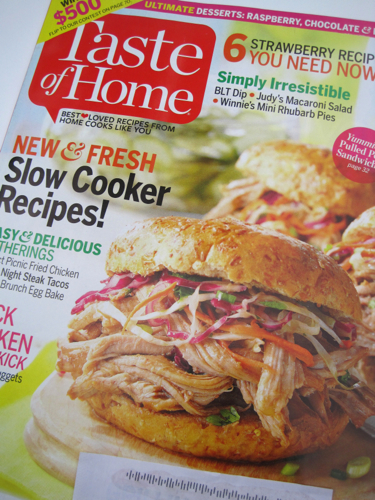 First up: the April/May 2016 issue of Taste of Home. My favorite article was the one about hosting a bridal shower or baby shower with an iced tea party. 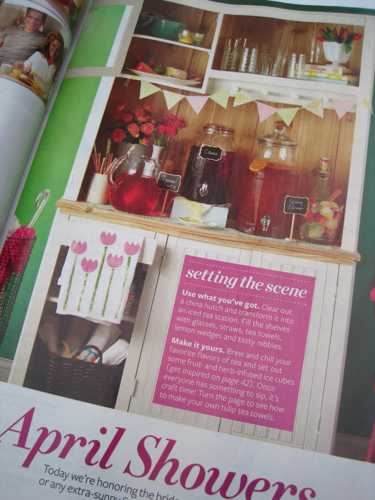 The iced tea station shown here incorporates a few of the ideas, and the article also has ideas for flavored teas and fruited ices to serve in the teas. 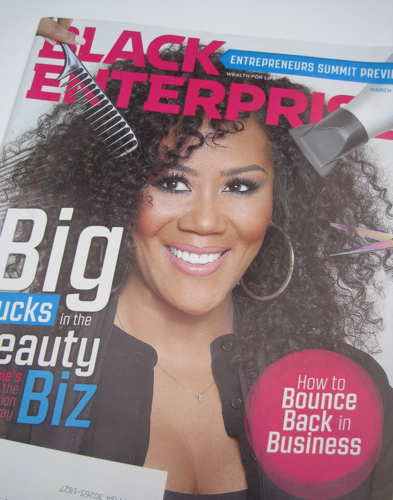 I read a number of business magazines these days, including Black Enterprise. 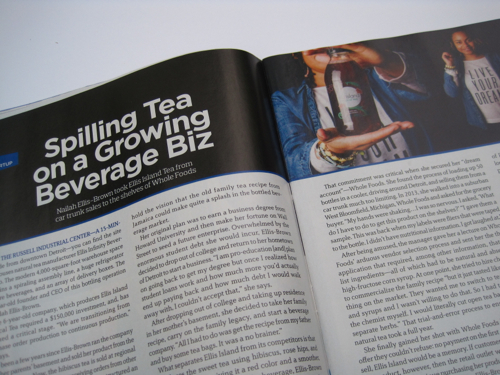 The March 2016 issue has a great feature on Nailah Ellis-Brown, the 28-year-old entrepreneur who started out selling her Ellis Island Tea from the trunk of her car and now has it in Whole Foods and other stores in the Midwest. The next time I visit a Whole Foods up north, you can bet I'll be looking for some of her tea. Meanwhile, you can read about this tea online by clicking here. Finally, Martha Stewart Living's May 2016 issue shares an idea for a new way to make iced tea, and it's so simple, I don't know why I didn't think of it sooner. To make 2-1/2 cups of iced tea, the piece says, add 3-4 tablespoons of loose tea to the strainer of a teapot. Add 2 cups of boiling water and let steep 3 minutes. Add 2 cups of ice, and by the time the ice melts, the tea will be the right strength. Add more ice and serve. 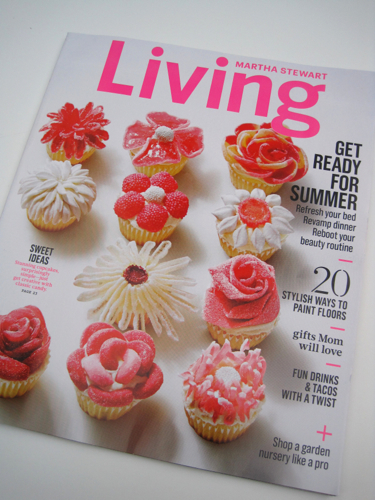 And those pretty cupcakes on the cover are made with candy, such as gummy peaches (the one at upper right) and mini marshmallows (second row, far left). If you made these in mini sizes, they'd sure be pretty at a tea party! A different kind of "tea party politics"
If you can spare a moment from this year's presidential election coverage (and isn't that a good idea anyway? ), I thought I'd share a fun photo I found this week on the Library of Congress website. 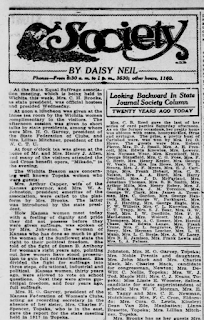 A hundred years ago, in 1916, the National Woman's Party, a group supporting women's suffrage, was formed. 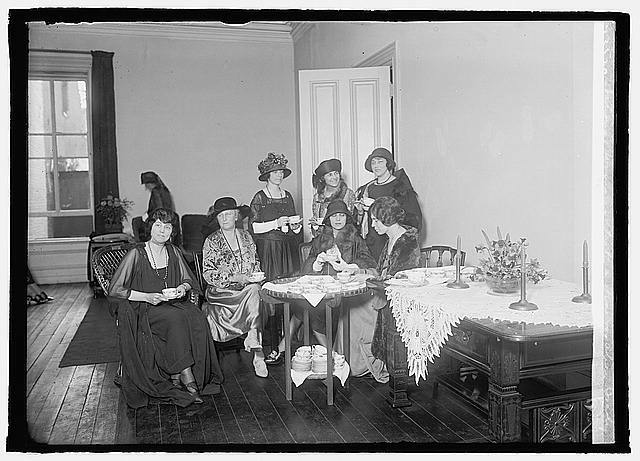 In this 1923 photo, some of the women are gathered for a tea in honor of actress Alice Brady, one of the organizers of the group. Click on this Wikipedia entry to learn more about her. There are a lot of women with short dark hair in this photo, so your guess is as good as mine as to which one is Alice! The National Woman's Party no longer exists, but those gals sure had an interesting history, chaining themselves to the White House fence among other actions! Click here if you'd like to learn more. 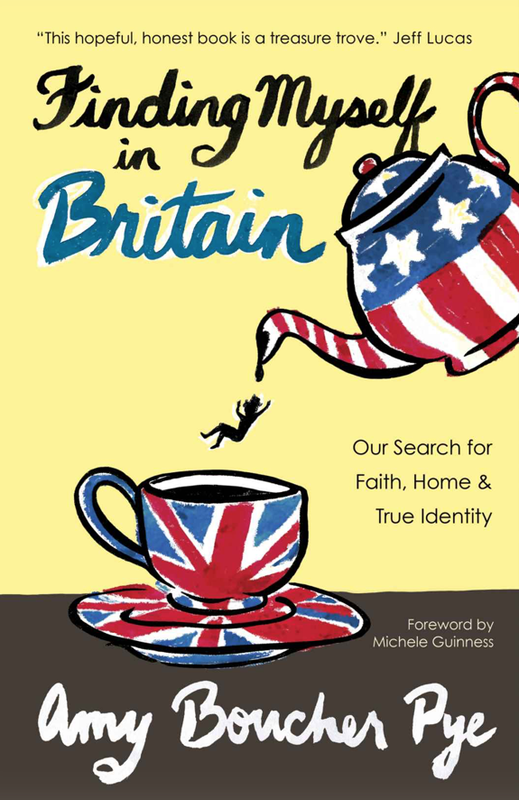 The clever cover is the first thing that caught my attention about Amy Boucher Pye's "Finding Myself in Britain: Our Search for Faith, Home & True Identity." I was intrigued by the American flag teapot pouring a little person into a Union Jack teacup, and the images end up being quite fitting for this tale of a Minnesota woman who meets and marries an Englishman who is on his path to becoming a minister in the Church of England. The tea references I expected to find turned up quite early. Chapter One is titled "More Tea, Vicar?" Pye writes that Americans tend to picture tea in the UK as "a post afternoon event," and one that "leaves scant room in their minds for such things as builder's tea, green-crockery-church-hall tea, or first-cuppa-of-the-day tea." She writes of her first date with her suitor, Nicholas, and serving him her best Good Earth caffeine-free spice tea, which clearly was not what he was accustomed to. And tea is only one of the many things that she finds different when she marries Nicholas and they move to the UK and begin their family. Let me be clear that this is a book for faith-minded readers and not a "tea book" per se, yet I think many readers of this blog would enjoy it. The book is organized into seasons, and I greatly enjoyed moving through them with Pye. In fact, I "greatly enjoyed" a lot of things in this book, including reading about a few of her missteps as an American. I learned, for instance, that one person told her that "you're never supposed to give your name early in conversations," when of course in this country we are told to be friendly by walking right up to someone and introducing ourselves by the full name. A small thing, but a thing, y'know? I also love that Pye carefully chose what to wear when going to church that first Easter in the UK. She chose a pink dress and pink shoes but not the pink hat. Good move, because "people didn't wear dresses in pastel hues for Easter in rural Cambridgeshire, and definitely sported no hats." While some of these little social moments made an impression on me, the greatest impression I got was what a challenge it was for Pye to truly feel she fit in over in the UK—much as she loved it—even once her children (the "Pyelets") came along. She frequently mentions feeling like a pilgrim on a journey, a feeling I sometimes share. When Pye titles her book "Finding Myself in Britain," she means that in more ways than one. So if you'd like a bit of thoughtful, often humorous, warmly written Christian philosophy along with your next cuppa, I highly recommend this book! 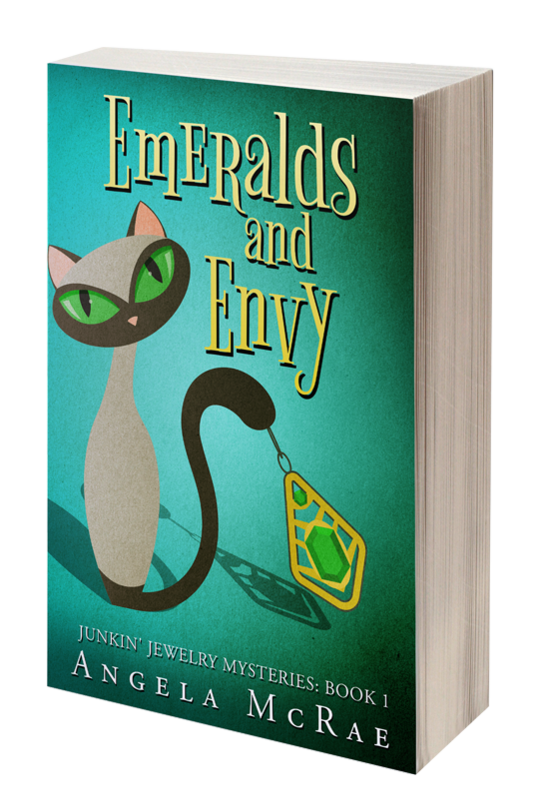 Note: While I was given my copy of this ebook for free from NetGalley, some of you may wish to order the print or ebook version online. Because this book had a lot of endnotes (often explaining some British terminology that might be unfamiliar to readers), I *loved* that I could click on the highlighted endnote in my ebook and it would take me to the passage at the end, then I could click right back to where I was previously reading on my Kindle. I'm very glad I had the ebook version! 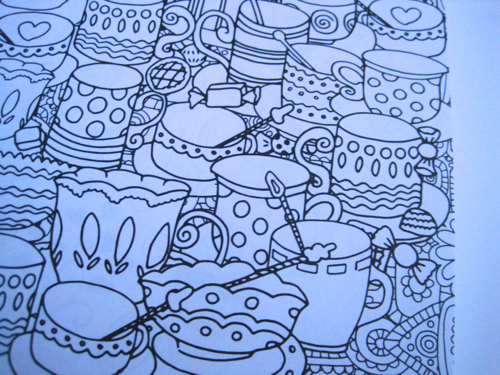 Coloring book review: "A Spot of Tea"
So the teatime shopping award of the week goes to Mr. 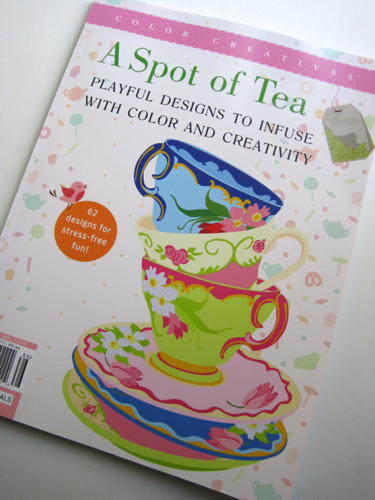 Tea With Friends, who spotted this when he was in the checkout line at Publix yesterday and got it for me! It's a coloring book published by Time Inc. Books ($12.99), and it's without a doubt the best coloring book ever! So guess what I did last night? As I watched (or rather, listened to) the evening news, I pulled out my colored pencils and went to town. First, I did a two-color design with aqua and pink. I love this, and it *is* frameable, because the pages in this coloring book are one-sided and perforated, so you can remove any picture you like! I think I need some fine point markers for this design. This one may be an all-day or road-trip project. 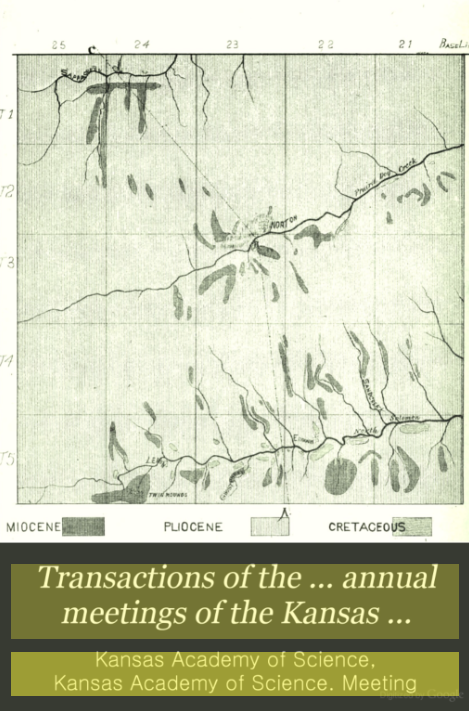 And there's a great variety of images in the book. Here's a detail from one with a bit more of a froufrou look. In case you can't find the book at your grocery store, here's a link to it on Amazon. Happy coloring! 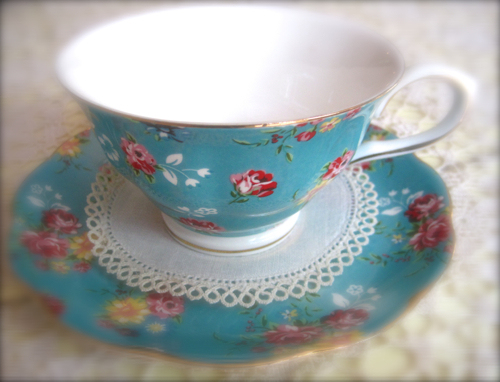 Recently on the Afternoon Tea Across America (ATAA) Facebook page, one of the members shared a photo of the most wonderful old Queen Anne teacup she'd found at her local thrift store, and I felt like such a thrift store slacker, as I had never come across a truly beautiful teacup at any of my haunts. "She just has better thrifting opportunities than I do," I thought, and I wondered if I'd ever come across a truly great find at any of my local thrift stores. Then, on Saturday, I was about to leave the Carrollton Goodwill store when I saw an entire shelf of teacups up front near the register, a sight I'd never seen at that store before. You know the feeling. Your heart starts racing, and you're hoping no one else will notice them until you can get there! 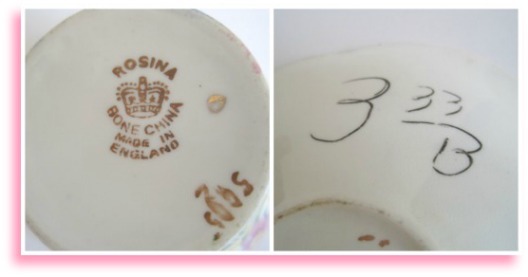 The first one I spotted: this Rosina chintz teacup, a piece that's long been on my wish list! 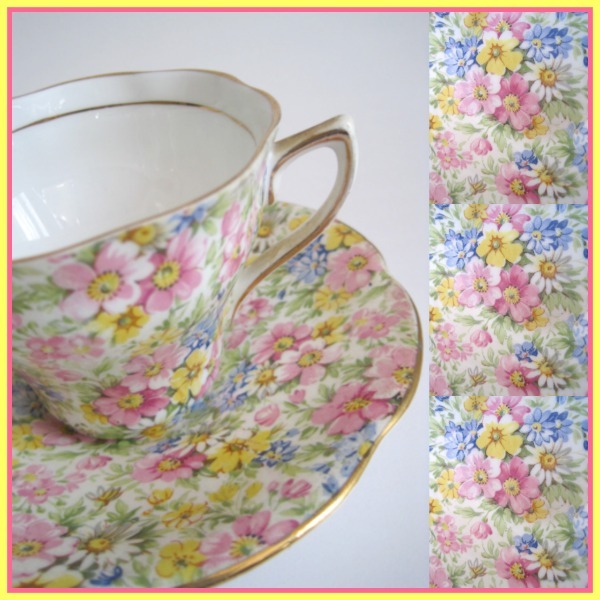 But no, the happy news is that even once I got home and removed the industrial-strength tape that Goodwill is so fond of using to hold its china cups and saucers together, this set was perfect. And since I paid just $3.33 for the set, I'm suddenly feeling much better about my thrifting opportunities. That great buy was just a matter of time! When I think of Iowa, I always think of the Iowa political caucuses that kick off our presidential election years. 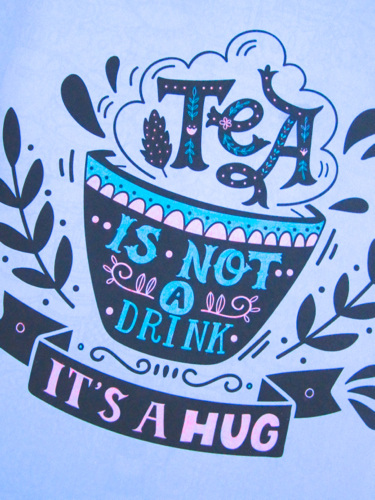 The caucuses have been over for months now, however, so it's time to leave politics behind and focus on tea! 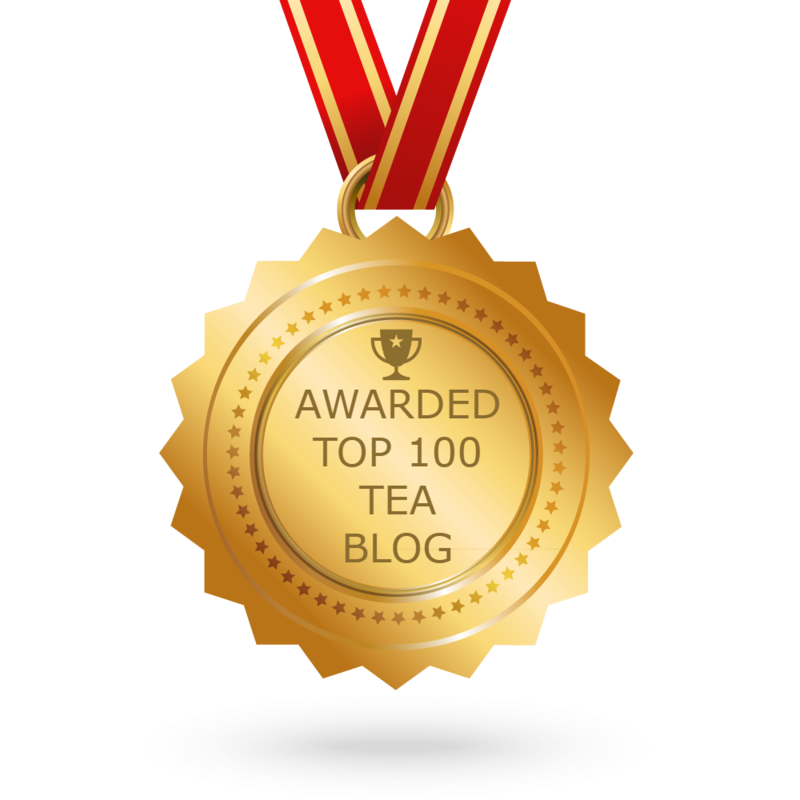 • As I continue along my year of looking for tea info in each state, I find that some state names are significant to me because I know that a famous tearoom once operated there. 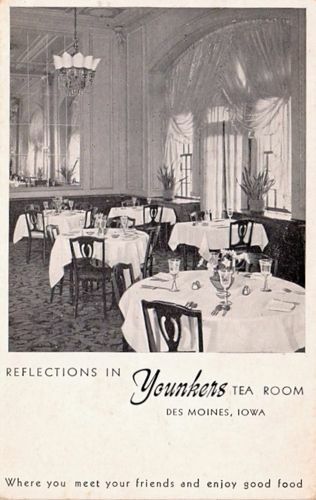 In Iowa, it was without a doubt the Younkers Department Store tearoom in downtown Des Moines that was the most well known. Among other foods, it was famous for its Younkers Chicken Salad, made with sunflower seeds and ranch dressing, which I made and reviewed here. The original downtown Younkers was under renovation when it was destroyed by fire about two years ago, so that’s a sad loss, but the Younkers chain of stores is still in business today. I bought a bracelet in a Dubuque, Iowa Younkers store when I traveled through Iowa a few years ago, and I wish I could have visited the old tearoom too! 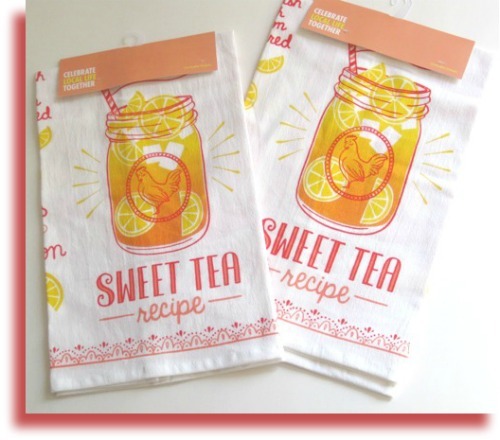 • Have you ever heard of the Iowa Tea Company? According to an article I found on Ancestry.com, Walter Samuel Winders, born in 1873, was a Fuller brush man before he founded the Iowa Tea Company in Mason City, and the company was one of Iowa's earliest tea, coffee, and china stores. They were "exclusive dealers in fine teas and coffees, extracts and spices, baking powder, chinaware and Japanese goods," according to the 1923 city directory. I’ve yet to locate a photo of Mr. Winders—or his tea company—but I’m intrigued that an early Iowa store specialized in tea, coffee, and china! • There’s an Iowa tearoom that’s long been on my bucket list, and it’s coming up on Teamap.com as the number one tearoom in Iowa: Miss Spenser’s of Longview Farms in New Virginia, Iowa. 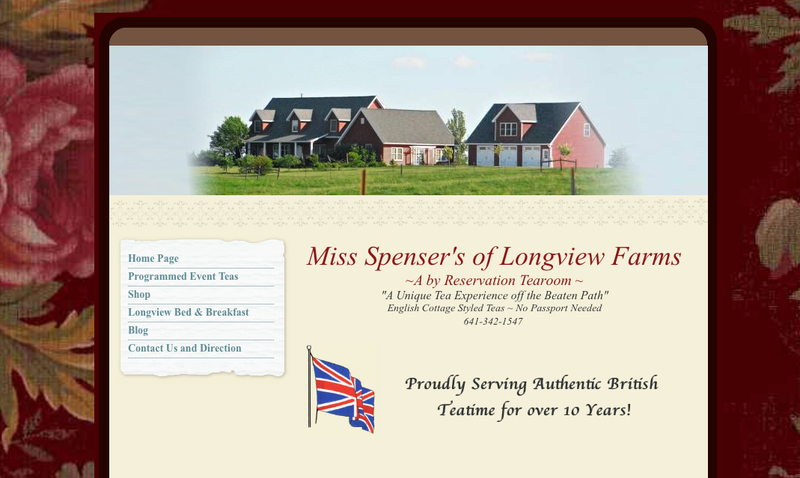 If you’ve been reading about the US tea world for a number of years, you may have come across accounts of this English-style by-reservation tearoom (and B & B) operated by the charming Lady Donna and Miss Spenser, who I feel I've gotten to know over the years through their blog posts and Facebook page. Click here to learn more and see why they’re number one in Iowa! Assam1860 tea, straight from the tea gardens! A review: Adagio Teas' "personalitea teapot"
Will Torrent's "Afternoon Tea at Home"
Presidential candidates speak out: Tea or coffee?